Thanks to a comment on this blog, I learned that the recently shuttered Red Robin on 183 and Anderson Mill is going to reopen. 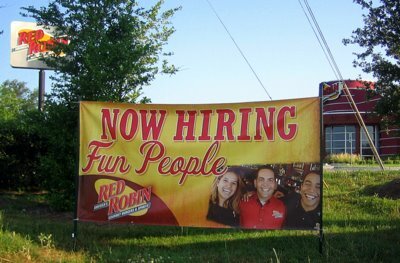 Stopped by on the way to work and there was a “we’re hiring” sign out front as well as a note on the door stating that they will reopen June 7th. where are all of the red robins??? I AM HUNGRY! COME BACK!!! this is getting ridiculous, first 183, now parmer…. is it because you know how desparate we are and you want to see if we will drive to san antonio or houston to get some RED ROBIN? Red Robin at Anderson Mill & 183 closed for good. Was actually going to eat there last week and it was all locked up. Called today, no answer. No great loss, but their burgers are serviceable, fries are endless and not terrible. There are still a couple of other locations in Austin, but this one was very close to work. Hey Allison, thanks for the update! Glad to hear it. I’ll make a new post about this news. I tried to eat at the Parmer/I-35 location today and IT was closed. What’s going on?? Is James going to be working there still? He was the best waiter! the south austin red robin closed. whats the skinny? Is it going to reopen? Was it a financial reason that they closed? Flash forward to 2012 … and it’s apparently closed again. My roomie worked there, and when he showed up this morning (3/5/12) they were boxing things up. Crazy. Red Robin site says “closed temporarily” for the Parmer location. Now the web site no longer says closed temporarily but it’s still closed up and no answer on the phone. What’s the story? Why did they close? We are Back!!! At Parmer ad I 35. The Food is Better than it ever was before. Please come ad try us again!